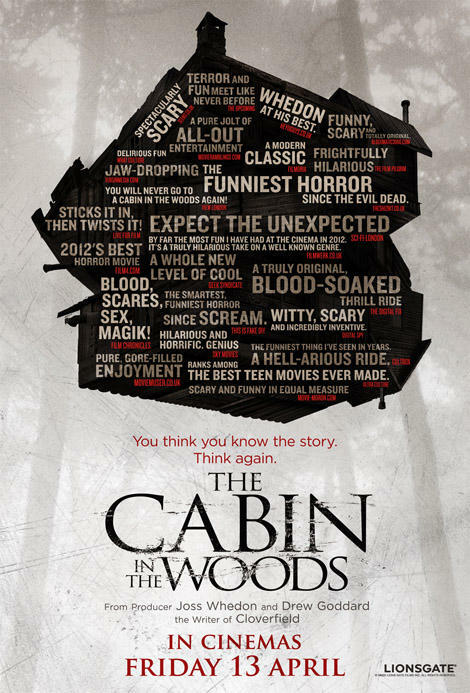 Synopsis: “Five friends go to a remote cabin in the woods. Bad things happen. Watching that trailer tells you almost NOTHING about the film. Yep, that’s what happens. 😀 But, the most telling is that last one. You think you know the story. I assure you, you do not. Let me tell you this: if more horror movies were like this, I might be more of a fan of the blood-filled genre. Before I continue, allow me to share with you how dauntingly difficult it is to write this review without spoiling the film. There is so much that is intriguing and fun about this film, but to mention the specifics would be to ruin several of the surprises. There are no spoilers in this review (as usual), but to truly get the feel and understanding of the uniqueness of this film, you must go see it for yourself. "The better to eat you with, my dear!" Director Joss Whedon (Serenity, Buffy the Vampire Slayer) brings a fun twist to the horror genre with a film that makes fun of the genre at the same time as making it interesting and, plainly put, not dull. So much points to the stereotypical things you see in horror movies nowadays: The scary loaner old dude who forebodes of danger, the dumb ditsy blonde, the athletic jock who’s not so smart, the comic relief, and more…it’s a riot to watch! 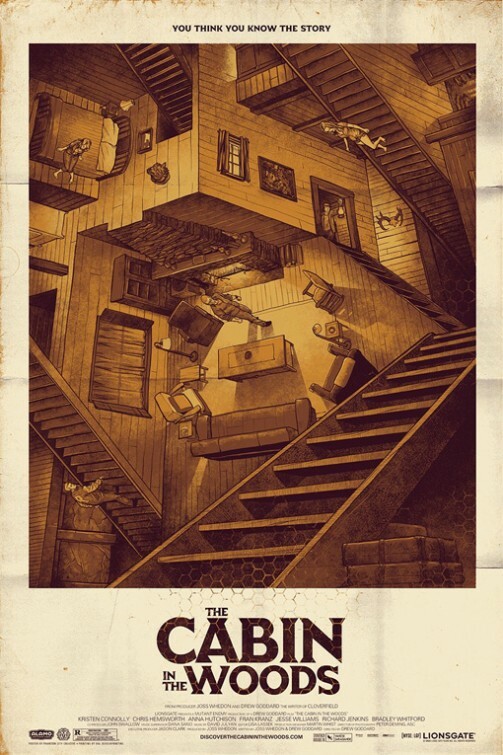 With a unique story that takes several twists and turns in multiple directions much like the poster below, The Cabin in the Woods teases in so many inexplicable ways and once you think you really know the story…BOOM, it introduces another entertaining spin of a level to the story. Needless to say, I was highly entertained. As I sat in the theater, hoping that this wouldn’t turn out to be another run of the mill slasher movie, I enjoyed the fact that it made fun of such stereotypes in the genre. Believable acting and special effects for a horror film makes it even better.Whedon’s direction and style of storytelling permeates throughout the entire film…and that is a good thing. 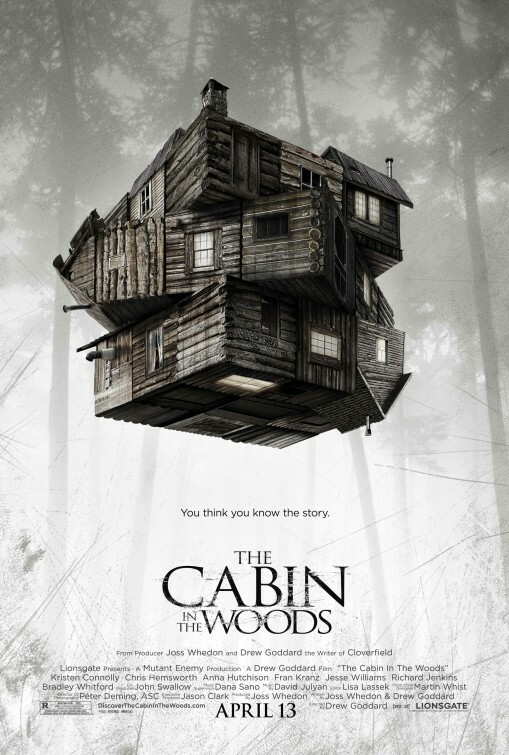 Along with a multi-faceted cast including Thor‘s Chris Hemsworth and Billy Madison‘s Bradley Whitford, The Cabin in the Woods is a story that may just birth some new believers in the idea that originality can indeed still exist in Hollywood and horror. While my attention was kept and the end-result remained a guessing game all the way to the end, I left the film still feeling a slight sense of dissatisfaction. The film was odd, creepy, entertaining, and yet still somewhat unsatisfying. (It is something I cannot truly explain without risking spoiling the film.) Guessing who lives and who dies is commonplace in movies like this, but when some of the numerous twists take place it adds even more fun to the guessing game as a whole. At times you will laugh so much that you may even forget that it is not a comedy, but is, in fact, a horror film…that is, until another decapitation or disembowelment takes place (and even then, you may be laughing). What a smorgasboard of laughs, shocks, screams, slashes, and twists/turns! Take a visit to The Cabin in the Woods…I guarantee it will be a visit to a secluded cabin in the middle of a scary woods with no help in sight that you will never…ever…forget. It is a fun horror flick that is imaginative, interesting, and indignantly makes fun of similar horror films that bore and reek of repetitiveness and unoriginality. hahaha “Slither”. I forgot about that one! Thanks for commenting! Nice review buddy. Glad to see it. haha. that would’ve been funny. I kept looking for Firefly, Buffy, and/or Angel references! Thanks Fogs! I’m assuming your reviewed it and scored it similarly then. I will be sure to visit today! I took a break from blogging over the weekend, with the exception of this post. hope you had a good weekend too. I wish I were more a fan of scary movies but the truly terrify me. I get one maybe two in a year and they can’t be super scary lol. Well, trust me, with this one, there may just be more laughs than screams for sure. Wow. I am not into the horror genre at all, but reading this makes me think i should give it a shot. At least rent it. Thanks T! I really think you should. Esp as it pokes fun at so much that we actually get bored with or hate about horror movies nowadays. Jaina summed up a lot very well in her comment. I just watched the trailer again & I think it’s a bit intense for the theater. I will definitely rent it though. I look forward to your thoughts should you venture to watch it! I think you will also like it very much Julian. How was your weekend? Did you see anything? Haven’t been over to your page in a couple days, but did you review The Hunger Games? sweet! I will be keeping a look out for them. Great film! Heard a lot of comparisons to Scream but I think they are too different to compare and I don’t think this is likely to have the same impact! I can see the comparisons to Scream – Scream deconstructs the horror film genre by the characters knowingly talking about what’s meant to happen in a horror film. Whereas Cabin deconstructs with the actions of the characters. I’d say similar, but definitely not the same. I enjoyed Cabin more than Scream. I can’t really explain it, but the sequels to Scream and the parodies of Scary Movie kinda ruined Scream’s appeal to me as well. Yes. I can see how some would compare it to Scream, but I am with you in that they are too different. I think that’s why I stayed away from the Scary Movie franchise. The Scream sequels I love. Well, 2 and 3. They’re not great by any means of the word, but they keep up the same themes. Albeit, not as well as the first. Scream 4? Well, that was just …. enjoyable but trash! I’ll just get my time machine and fix that! I see your shortcomings about the ending but by then, I don’t think I cared too much. I saw that that was potentially where it was going (smacked of a mixture of Buffy and Angel eps) and was quite happy to let them just unfold it all. What I’m happy about with this film is that it is getting talked about and it is getting good critical reviews. It isn’t just another found footage horror film. It’s not another exorcism horror flick. It’s something different. Which is what the horror genre is in desperate need of. Hopefully, it’ll start making studios think again about the horror they back. Right? It’s not another exorcism, found footage, possession horror flick. Being something different really worked in its favor. I hope that more horror films take cues from the Cabin. Me too. But I hope they don’t just see what they have seen and think they can just blatantly copy it! true. Well, they can copy it by means of using originality. but only that! I am pleased you liked it T. I loved it very much, probably more than I should but hey. It was just so much fun! I really liked the feeling of unpredictability that permeated this entire movie. You got the feeling that Goddard and Whedon were really throwing ideas at a dart board and seeing what stuck. The last act was just insane. Everything didn’t completely work, but it’s great to see them take a shot. On a random note, I also enjoyed in your review how you listed Bradley Whitford as being from Billy Madison. I’m not sure he’s putting that at the top of his resume. Nice review! haha. I am so glad someone picked up on the Billy Madison use in the review! Good eye! thanks for commenting. I was glad for the guts that Whedon and Goddard had in creating this film. It really was a lot more enjoyable than I thought it would be. Thanks for reading and sharing your fun thoughts. I don’t know how it escaped me that Whedon is directing this. Well, I don’t have the nerves for horror flick so I’ll be skipping it. So I guess Hemsworth is working w/ Whedon back-to-back then, they must become best buds now, ahah. i understand your hesitance, and while i am not a horror fan, I will tell you, I enjoyed this quite a bit. It’s funny that people talk about M. Night Shyamalan and Christopher Nolan using the same actors quite a bit, but Joss Whedon has done that numerous times as well. with Chris Hemsworth, Amy Acker, Nathan Fillion, and others! I always expect a Whedonite to be in anything Joss does these days! Here we had Fran, Amy and Tom Lenk (who played the intern). But it was so cool seeing crew members from the ol’ Buffy/Angel days up in the opening credits too. yeah, I noticed that. it’s always fun! He didn’t direct this, he did write alongside Drew Goddard though. Drew was the master behind the direction here and he did a brilliant job in my eyes.